Looking NE at excavation over east side of front garden gateway. A very wet morning was spent continuing the excavation of the east side of the front garden gateway. The photograph above was taken last week – on Sunday it was far too wet to take any photos on site. 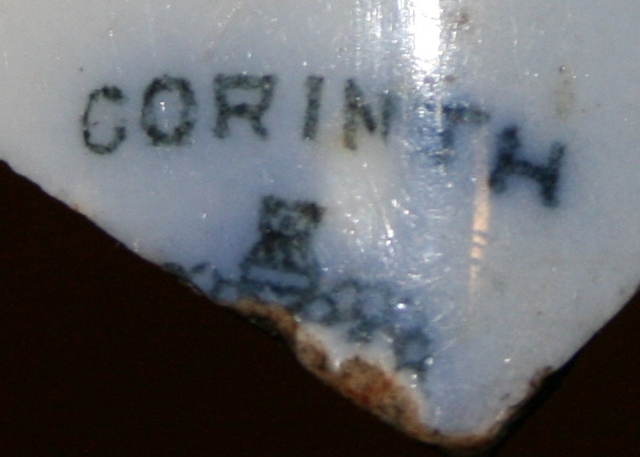 This blue and white ceramic shard has – on its reverse – the word ‘Corinth’ over the top most part of a crown. Research suggests that ‘Corinth’ was the name of the pattern, but the design of the crown mark failed to match any of 2,656 shown on the marksandlibrary.com website. For our last two coming Friday and Sunday dig days before Christmas – if we get enough volunteers – we may be able to open a small extension to a trench on the south side of the cottage to explore a drainage pipe observed in the wall of our southern most trench side (though this is far from being a priority); was it to divert rainwater to a nearby water-tank or well? Our priority however, is to finish the excavation of this 1x1m area over the entrance of the front garden gateway, and to give the site a final clean up for our promised hi-res laser scan on Monday (weather and other factors permitting). 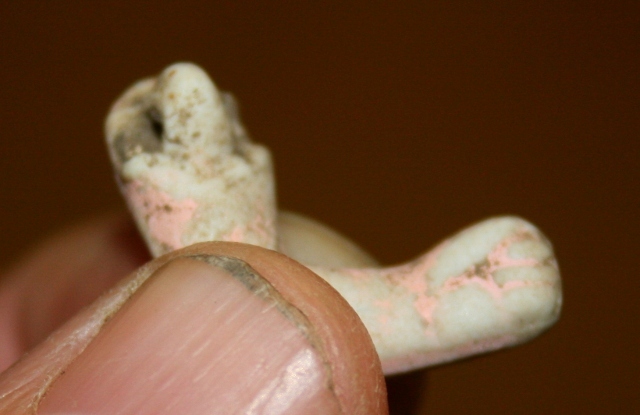 We also need to complete our survey of the site, and to collect any representative building material samples which have not as yet been added to our finds collection. As yet we are still looking for a mechanical digger – this is very much a priority – to be done as soon as possible after a well-earned Christmas break. 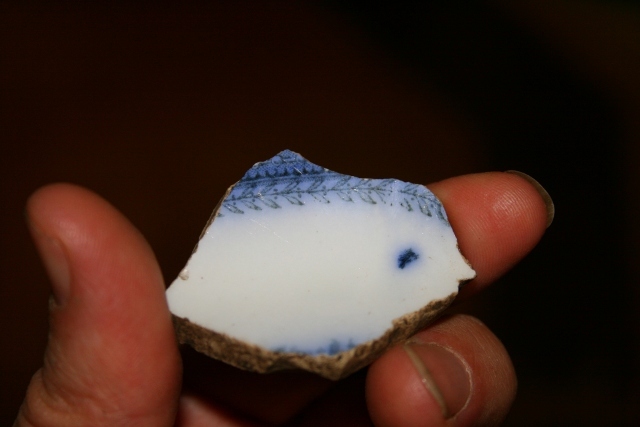 If there is time between the laser scan and the back-filling of the site, I would very much like to fully excavate the salt-glazed stoneware drain on the north-east corner of the cottage in case we can find a datable manufacturer’s mark. 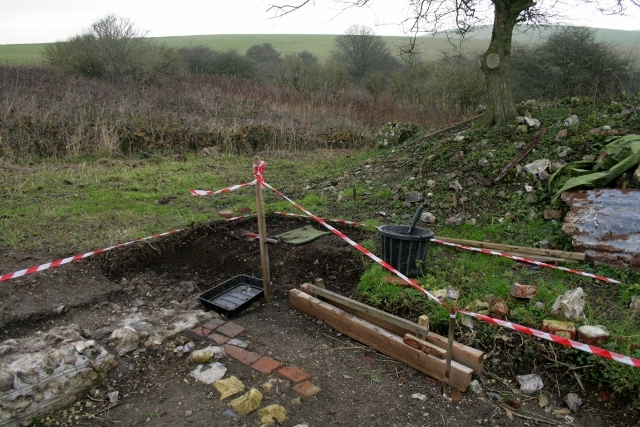 I would also like to dig a very small sondage down to the bedrock in front of the kitchen window and also by the masonry blocks by the north-west corner of the cottage just in case the well (or water-tank) – which the oldest of the Latham family children believes used to be there – was back-filled before the demolition of the cottage and thus has been hidden from our excavation so far.